One sunny afternoon, sitting at a cafe on the beautiful streets of London or Sydney, you see a Royal Enfield 1968 G2 as beautiful as a an angel sent from heaven, and you wonder where it might come from, as mysterious as it would seem. Well, now you know – this painstaking job of getting vintage Royal Enfields back to life in immaculate condition and exquisite aesthetics is a high valued project of Vintage Rides. 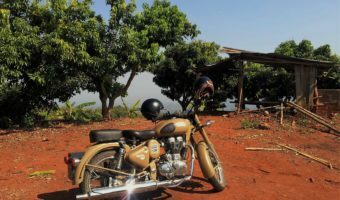 Having an experience of more than 7 years of Riding and Exploring India, Vintage Rides has came across hundreds of Royal Enfield motorcycles all along our tours across India. As we’re passionate of bringing vintage bikes to life, we often take the old and rusty bikes along with us, to give them a second chance. Our highly skilled mechanics will start the 60 days-long process of opening up and restoring the engine, checking the chassis for any mis-alignments and fixing everything on the frame. Then come the custom made external body parts which look exactly as they were back in 60’s. After completing the restoration, we make sure to do a few rounds of test rides to officially mark the motorbike as Safe to Ride. Also, as an extended service, a kit of spare parts is also provided to the Rider to enable quick fixes wherever necessary. Now you must be thinking that how come this restored vintage bike ended up in the streets of United Kingdom, Australia, or even the US? Well, with out extended international logistics partners, we can get the vintage bikes to international Ports in just over a month’s period. If you were concerned about the registration process of this royal beast in your own country – well, you shouldn’t. The bikes we sell and export are more than 25 or 30 years old, and as an exception, they are not required to meet the strictest emission regulations of nowadays. Thus, you will get them registered and hit the streets in no time. The idea behind all this is simply to give our generation what the bygone era has left to us, to keep alive the gifts of the past and encompass these beauties from 60’s into the riding practices of today. And if you wanted a Royal Enfield exported and shipped to your country, get in touch at info@vintagerides.com and we will arrange it for you. Just one word of advice : Nostalgia is addictive.